The Three Californias Initiative addresses the critical need for reliable information and analysis, constructive dialogue and well-informed public policy decisions to advance California’s ties to Mexico, particularly its neighboring states of Baja California and Baja California Sur. The Initiative supports applied research and policy forums to provide a fact-based, neutral venue for public dialogue on key issues in our binational region including cross-border governance, trade, workforce development, quality of life and the environment. Amid contentious political rhetoric and tightening borders, global trade and investment are top of mind for national leaders and companies alike. 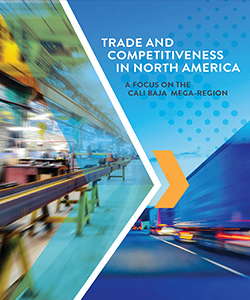 To contextualize the importance of such international connectivity, this research summary quantifies trade and competitiveness in the Cali Baja mega-region, spurred in part by the negotiation of the North American Free Trade Agreement (NAFTA). The report was produced by World Trade Center San Diego, with research support from Center for U.S.-Mexican Studies at UC San Diego’s School of Global Policy and Strategy. Read online | Download report (PDF); also available in Spanish (PDF). San Diego is part of the Global Cities Initiative, a joint project between the Brookings Institution and JP Morgan Chase. Students and scholars from GPS, the Center and UC San Diego contributed vital research to this initiative. Read online more about the initiative and download the executive summary and full report. A study on cross-border employment and industries is being conducted in collaboration with the Colegio de la Frontera Norte and the Cali-Baja Mega-Region Initiative, with support from economists at the San Diego Association of Governments (SANDAG). A report on the first phase of the project was released in 2014. In addition, a map of binational industry clusters created using an economic input-output model of the binational economy is close to completion.